I've made tamales a number of times and it never fails. Each time I make them, I fall in love with tamales all over again - even moreso when cooking them in the Instant Pot. For these tamales, be prepared to really use your Instant Pot for pressuring cooking the filling and again for steaming the tamales once assembled. When pressure cooking the pork filling, the cilantro flavor is absorbed as the pork cooks in a puree of cilantro, tomatoes, jalapenos, garlic, onion, lime juice and seasonings. While the pork cooks, you can prepare the masa dough. The dough itself requires some patience to get the right consistency. If you want that fluffy masa, plan to chill the dough for an hour before assembling. The dried corn husks in which the tamales are wrapped will also need to be soaked in warm water so they become pliable and easy to fill. Lastly, the most fun part of making tamales is assembling them. If you have some extra friends that want to help assembling, use them! A lot of great conversations can be had while assembling tamales. 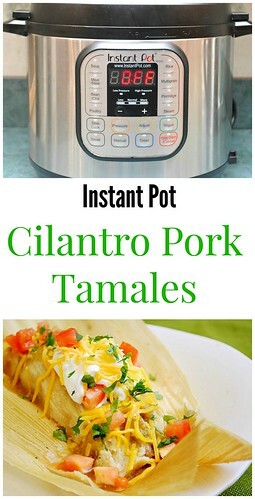 As you assemble them, have your Instant Pot ready then steam the tamales all at once. After they're done, cool them slightly before enjoying or cool them completely before packing them for the freezer. To serve, garnish them with a dollop of sour cream, a sprinkle of cheese and a little touch of chopped fresh cilantro and tomatoes. 1. Preparing the filling. In a large blender or food processor (or working in batches), combine the filling ingredients except the pork. and broth Cover and blend to a smooth puree. Transfer puree and broth to IP and add pork. When the IP beeps after pressure cooking for 60 minutes, allow your IP to naturally release pressure for 10 minutes. While naturally releasing pressure (also known as NPR or NR), the display will reflect numbers counting up from 1. The numbers indicate how many minutes the IP has stopped cooking since it beeped (or how many minutes it has been naturally releasing pressure). No need to touch your IP while it naturally releases pressure. Remove the pork from IP and allow to cool enough to handle with your hands or forks. Shred pork and place in a large bowl. 2. Preparing the masa dough. In a bowl of a stand mixer fitted with the paddle attachment, combine together the shortening/lard, salt, powder and masa on medium speed. Reduce the speed to medium-low and add 1/2 cup of the broth. Continue beating for another minute or so, until the water or broth is used up. To test that the masa is ready, place a 1/2-teaspoon dollop in cold water (if it floats you can be sure the tamales will be tender and light). Beat in enough additional broth to give the mixture the consistency of soft (not runny) cake batter; it should hold its shape in a spoon. Taste the batter and season with additional salt if you think necessary. 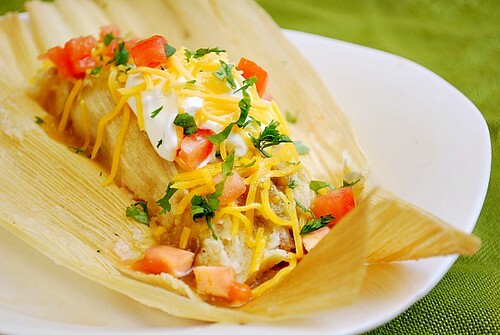 * For the lightest textured tamales, refrigerate the batter for an hour or so, then rebeat, adding enough additional broth or water to bring the mixture to the soft consistency it had before. 3. Preparing the corn husks. Soak the dried corn husks in warm water to soften and make pliable for filling. 4. Setting up the steamer. Steaming tamales can be done in batches in a collapsible vegetable steamer set in your Instant Pot. It is best to line the steamer with leftover scraps of softened corn husks to protect the tamales from direct contact with the steam and to add more flavor. Make sure to leave tiny spaces between husks so condensing steam can drain off. 5. Forming the tamales. Cut twenty thin strips of soften corn husks. One at a time, form the tamales: Lay out a husk, smooth-side up, and spread 1/3 cup of the batter into an 8x4-inch rectangle over the middle section. Spoon 2 tablespoons of the filling over the left side of the rectangle of batter, then fold in the right third of the leaf so that the batter encloses the filling. Fold in the uncovered third of the leaf, then fold in the top and bottom. Loosely tie the tamales with husk strips and set them in the steamer. 6. Steaming and serving the tamales.